A c.v. is an autobiographical act, a life composed and presented according to certain conventions, a story designed to hide, exaggerate, downplay or boast about aspects selected from the immense and muddled curriculum of one’s whole life. Because I’ve mostly made my living as an academic, my c.v. is dominated by publications, presentations, lists of research grants, committees and so on. It doesn’t tell the story behind these lists. For example, behind each of the books is a story of why it came to be written and how, in what order its chapters got themselves assembled and juggled about, how much agonising and rethinking and reworking went on, whose advice was taken (or not taken) on the path to its final form. For those who make their living as digital academics, unavoidable autobiographical actions multiply. There are ‘about’ pages, social media bios and profile pictures to be chosen across the whole range of platforms. This is often talked about as ‘branding’, with all the off-putting connotations that phrase has, framing the action in narrow terms of instrumentality and impression management. Whereas I’d much prefer to think of these as autobiographical acts, albeit ones which are peculiarly brief, fragmented and dispersed. The challenge which the digital academic faces as an autobiographical actor is how to transcend this fragmentation, building up these micro-acts of autobiography across platforms into a sustained and substantial account of oneself and one’s work. One important way to do this is to use social media to reveal “the story behind these lists”, conveying how these individual outcomes are expressions of underlying preoccupations and long-standing projects. There can be a certain conceit buried behind dismissals of this process, as securely tenured academics with identity-conferring positions look scornfully upon these forms of autobiographical action as narcissistic fiddling by self-involved millennials. But if we take the framing of autobiography seriously, we can see ‘online identity’ as a way to begin to reclaim the agency of those who are systemically denied the security which previous generations could take as a given. Glasgow artist Penny Anderson’s first exhibition in Manchester, in association with the Social Action and Research Foundation, presents work that interrogates the modern fact that we do not remain in a rented home for a life-time, with many tenants having to move house every six months. ‘Let Me Stay’ uses the traditional craft of embroidered labels attached to read-mades such as doll’s furniture and crockery, samplers which are all placed within this installation to explore precarity and insecurity – to contribute to a much needed debate on the condition of houses not being homes for many people in society. The exhibition will be held at Manchester Creative Studio, 16 Blossom St, Manchester, M4 5AW between Saturday 26th March to Tuesday March 29th. Opening private view 6-8pm Friday March 25th. With thanks for the generous support of Creative Scotland’s Open Fund. Much deserved Guardian coverage of the weird phenomenon that is the internet cat video festival. What grips me about things like this is not the fact that people are trying to make money from their cats, but rather that many others people are trying and failing to make money from their cats. Not unlike the aspiring professional pick up artists, though you’ll have to read this brilliant paper to see what I’m getting at. This looks like a great special issue of tripleC. I’m going to get started on it as soon as I finish this special issue of The Sociological Review on Gender & Creative Labour. I did an interview with the editors of this issue & it left me aware that I’m even more interested in these questions than I thought I was previously. We are thrilled to announce the publication of “Interrogating Internships: Unpaid Work, Creative Industries, and Higher Education,” a special issue of the journal /tripleC: Communication, Capitalism & Critique/. The issue features 22 articles, 32 contributors, and a mix of academic and activist accounts. A launch event in Vancouver is in the works. As an open-access journal, all of the articles are freely available. Creativity has become so elevated as a characteristic of individuals and nations in recent years that it has taken on a status almost beyond critique. Banks (2007) talks of ‘the creative fetish’; Osborne (2003) argues that creativity has become a ‘moral imperative’; whilst Ross (2009) contends that creativity is the ‘wonderstuff’ of our time, the ‘oil of the 21st century’. The CCI are hailed in policy documents for their capacity to stimulate national economies, to regenerate depressed urban areas, to aid in attempts to build social inclusion and cohesion, to challenge unem ployment, and even to improve nations’ health (eg Cunningham, 2009; Keane 2009; Power, 2009). There is nothing they cannot do, it seem. In their introduction, the editors offer some quite specific analysis of the complex web of influences which have contributed to present day mythology. For my project, I’m less interested in the cultural history than I am in the observation that creative work is no “understood to offer the possibility of personal fulfilment or self-actualization, albeit in return for considerable hard work and an absence of financial security” (Conor, Gill and Taylor 2015: 5). This sense of the deeper meaning of creative work, its connection to something higher and more meaningful, naturalises structural constraints as creative realities: this is what the creative life entails. I’m interested in how this plays out in the internal conversations of particular individuals, as well as the interactions between them. Is this mythology something people draw upon to talk their way through the working day e.g. “I know it’s hard but I’ve just got to continue like this for the rest of the year and then I’ll get a permanent position”. How are doubts managed interpersonally? Do the individualistic connotations of this mythology mitigate against solidarity? I’ve sometimes noticed a sense of this within discussions of academic labour, in which certain people are described as trying to get somewhere without doing the necessary work or ‘paying their dues’. This combination of project-based working, with all the co-ordination costs each new project entails, with future-orientated working, constantly being on the look out for new opportunities, jointly manifests in an intensification of work expressed in the necessity of continually switching between two distinct temporalities. As the editors put it, “the ‘flexibility’ of flexible work is designed around the needs of the job rather than those of the worker and, like risk, is transferred onto individuals” (Conor, Gill and Taylor 2015: 11). This is compounded when material necessity leads to juggling ‘outside’ jobs alongside ‘inside’ commitments, itself made worse when the aforementioned mythology of DOING WHAT YOU LOVE throws up practical obstacles to managing one’s working life effectively. Under these circumstances, creative workers must be ‘always on’: undertaking long hours, establishing their commitment, working to other people’s schedules, maintaining a level of commitment that would have once been confined to ‘crunch times’. As the editors note, “vigilant self-monitoring needed to maintain or expand individual professional biographies” and this entails a cognitive cost which, I would argue, inevitably manifests itself in other sectors of the lived life (Conor, Gill and Taylor 2015: 14). I like how they analyse this in terms of the ‘boundary crossing potentialities’ of creative work and I think I can situate my own project as, in part, a theory of such boundary cross (in general) and how it manifests itself over the life course. Professional associations and trade unions served to anchor collective life, such that in their absence “the collective definition of what it means to be a (particular kind of) creative professional or practitioner will be replaced by individual claims” (Conor, Gill and Taylor 2015: 13). This works nicely alongside my analysis of cognitive triage as leading to the contraction of temporal horizons: the withdrawal of collective institutions leads social horizons to become individual ones, while the escalation of situational demands engenders an increasing loss of future orientation beyond the demands of the next project (or finding it). Not all of the papers in the monograph are relevant to my project. Perhaps my favourite is Stephanie Taylor’s A new mystique? Working for yourself in the neoliberal economy. She argues that the fate of those increasing numbers who are working for themselves (now 1 in 7 workers in the UK) can be understood in terms of the conditions that have long prevailed within the cultural industries, both in terms of “the uncertain incomes, fragile career trajectories and general precarity” but also the familiar mythology in terms of which this uncertainty is understood, as a life lived in accordance with one’s passions is seen to license endemic insecurity and sustained marginality. Taylor identifies a new mystique attached to the freelancer, “who works on a small scale, mostly alone and from home, motivated by the hope of self-fulfilment and freedom as alternative rewards to a steady income and secure employment”. This mystique provides cultural reinforcement for a process in which “increasing numbers of workers, both male and female, are encouraged to accept a marginalized position in the neoliberal economy” (Taylor 2015: 1-2). An important aspect of this mystique is the centrality of home to working for yourself, overburdened by parallel meanings in private opposition to the public sphere of work and also as an expression of the undifferentiated pre-industrial sphere of the workshop. Taylor’s argument is that “the creative promises of the workshop and studio as living/working …. promote a withdrawal from the challenges of paid employment and a return to this more private and personalized site” (Taylor 2015: 10). However as she goes on to note, the available data suggests that “the relevant narrative of working for yourself may be less about career beginnings, prospective expansion, ambition and entrepreneurial success than about sustaining yourself through difficult circumstances, like unemployment, and coping with inadequate pensions, insufficient earnings and the need to raise the next generation” (Taylor 2015: 12). Unfortunately the retreat into the home, with all the concurrent tendencies to individualisation discussed earlier, helps reinforce the retrenchment of social support and solidarity for the risks both motivating it and compounded by it. Taylor’s paper sits interestingly alongside the analysis of unpaid internships offered by Leslie Regan Shade and Jenna Jacobson in their paper Hungry for the job: gender, unpaid internships, and the creative industries. They identify how unpaid internships have both expanded and been institutionalised, often becoming a formal part of the higher education system. Unpaid internships offer the possibility of achieving “a competitive advantage for scarce paid positions in a contingent job market” (Shade and Jacobson 2015: 190). The obvious problem is a differential capacity to identify them, gain them and support oneself through them. As they observe through the interview study, parental support plays a crucial role in capacity to undertake an unpaid internship and in many cases this support was something that had extended throughout post-secondary education, leaving the intern without the crushing tuition debts accrued by others within their cohort. This allows them to escape being forced into the first job they can find, in order to avoid spiralling debts due to the interest accrued on tuition loans. In many cases, this also entailed living at home with parents, in order to minimise cost of living. As the authors put it, parental support “provides young people with the necessary stability they need during such precarious economic periods” (Shade and Jacobson 2015: 194). It’s also of course the case that these internships frequently lead nowhere, often manifesting in cycles of unpaid work occasionally coupled with the search for paid employment. This is true even of some of those receiving parental support, leaving the interns in question working a number of hours weekly far beyond that notionally required by a full time job, with all this entails for cognitive triage and their temporal horizons. I’ve included a screen shot below (HT @Andr_Dim) , in case the advert mysteriously vanishes from the internet. 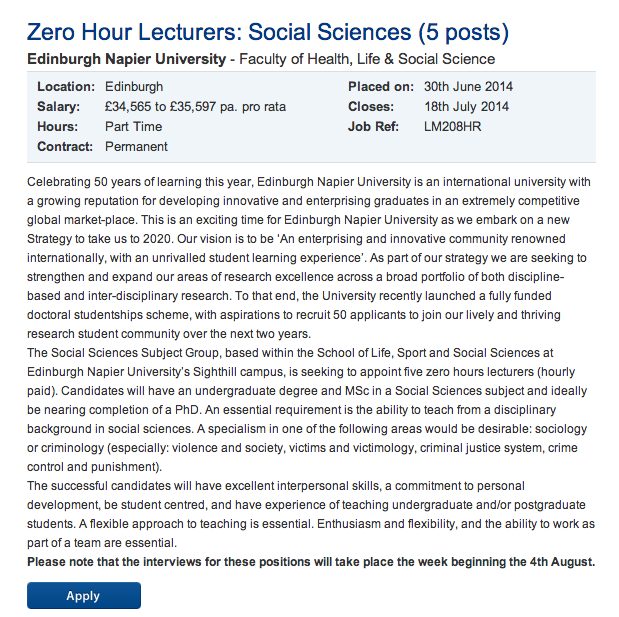 What really disgusts me about this is the shamelessness of the mission statement – this is “an exciting time for Edinburgh Napier University” in which they seek to become an “enterprising and innovative community” through expanding their “areas of research excellence across a broad portfolio of both discipline-based and inter-disciplinary research”. By which they mean they want to replace securely employed staff with recently completed PhD students on zero hour contracts. But I’m also in the middle of doing lots of e-mailing as a research associate (in the general doer of things sense of the role) in the data sciences team at Warwick Business School. I’m e-mailing lots of people who don’t know me and because I can’t stand outlook I’m e-mailing them from my private (gmail) address which has my personalised domain name. My warwick e-mail automatically forwards to my personal address and, though I’ve been trying to remember to ‘send as’ from my warwick address I keep forgetting to do this because I’ve spent years not doing it. It seems obvious that it would be useful to me, as well as to the people I’m e-mailing, to sign post who I am and what I’m currently doing. How? If I add WBS to my e-mail signature I immediately feel I should also add my post-doc in the sociology department, which is less pressing e-mail wise in the short term but has a much longer duration. Almost immediately, my e-mail signature comes to look very messy. There is a name for those under- and precariously employed, but actively working, academics in today’s society: the para-academic. Para-academics mimic academic practices so they are liberated from the confines of the university. Our work, and our lives, reflect how the idea of a university as a place for knowledge production, discussion and learning, has become distorted by neo-liberal market forces. We create alternative, genuinely open access, learning-thinking-making-acting spaces on the internet, in publications, in exhibitions, discussion groups or other mediums that seem appropriate to the situation. We don’t sit back and worry about our career developments paths. We write for the love of it, we think because we have to, we do it because we care. We take the prefix para- to illustrate how we work alongside, beside, next to, and rub up against, the all too proper location of the Academy, making the work of higher education a little more irregular, a little more perverse, a little more improper. Our work takes up the potential of the multiple and contradictory resonances of para- as decisive location for change, within the university as much as beyond it. Specialists in all manner of things, from the humanities to the social and biological sciences, the para-academic works alongside the traditional university, sometimes by necessity, sometimes by choice, usually a mixture of both. Frustrated by the lack of opportunities to research, create learning experiences or make a basic living within the university on our own terms, para-academics don’t seek out alternative careers in the face of an evaporated future, we just continue to do what we’ve always done: write, research, learn, think, and facilitate that process for others. We do this without prior legitimisation from any one institution. Para-academics do not need to churn out endless outputs because of the pressures of a heavily assessed research environment. We work towards making ideas because learning, sharing, thinking and creating matter beyond easily quantifiable products. And we know that this is possible, that we are possible, without the constraints of an increasingly hierarchical academy. As the para-academic community grows there is a real need to build supportive networks, share knowledge, ideas and strategies that can allow these types of interventions to become sustainable and flourish. There is a very real need to create spaces of solace, action and creativity. The Para-Academic Handbook: A Toolkit for making-learning-creating-acting, edited by Alex Wardrop and Deborah Withers, calls for articles (between 1,000-6,000 words), cartoons, photographs, illustrations, inspirations and other forms of text/graphic communication exploring para-academic practice, and its place within active intellectual cultures of the early 21st century. It will be published by HammerOn Press in 2014. Deadline for submissions 1 July 2013. Precariousness is one of the defining experiences of contemporary academic life — particularly, but not exclusively, for younger or ‘career early’ staff (a designation that can now extend for one’s entire ‘career’, given the few opportunities for development or secure employment.) Statistical data about the employment patterns of academics shows the wholesale transformation of higher education over the last decades, with the systematic casualisation of the workforce. Continuing contracts — understood in the US as tenure-track appointments — now represent only just over half of academic posts, with 38 % of all academics in higher education on fixed term contracts in 2006-7 (Court and Kinman, 2008). While, in the past, short-term contracts were largely limited to research positions and tied to specific, time-limited projects, today they also characterise teaching posts which are frequently offered on a one-year temporary basis at the bottom of the pay scale. However, even these posts constitute the ‘aristocracy of labour’ when compared to the proliferation of short-term, part-time teaching positions, contracted on an hourly paid basis, in which PhD students or new postdocs are charged with delivering mass undergraduate programmes, with little training, inadequate support and rates of pay that — when preparation and marking aretaken into account — frequently fall (de facto) below the minimum wage and make even jobs in cleaning or catering look like attractive pecuniary options. Alongside such jobs is the newly created stratum of ‘teaching fellowships’ in which, as a cost-cutting measure for University management, work once rewarded with a lectureship is repackaged for lower pay, stripped of benefits (eg pension) and any sense of obligation or responsibility to the employee, and offered purely on a term-time basis, frequently leaving teaching fellows without any source of income over the summer.